Santa Barbara, California, is a famously beautiful place, but if you look offshore from one of the city’s many beaches, you’ll see a series of artificial structures that stand out against the natural blue horizon. These oil platforms are at the center of a complicated debate going on right now within the environmental community about the relationship between nature and human infrastructure. And while the debate has changed, their presence has been controversial since the platforms first went into the water back in the 1950s and 60s. At the time, a lot of people thought of the area as a coastal paradise and were worried about the impact of these new structures on the tourist economy. But there wasn’t a whole lot anyone could do. The EPA didn’t exist yet and there were no major environmental regulations in place. So the oil platforms went in and operated without any major spills until January 28th, 1969, when an oil well beneath one of the platforms blew out. It turned out that the oil company had failed to build a big enough protective casing for the well. 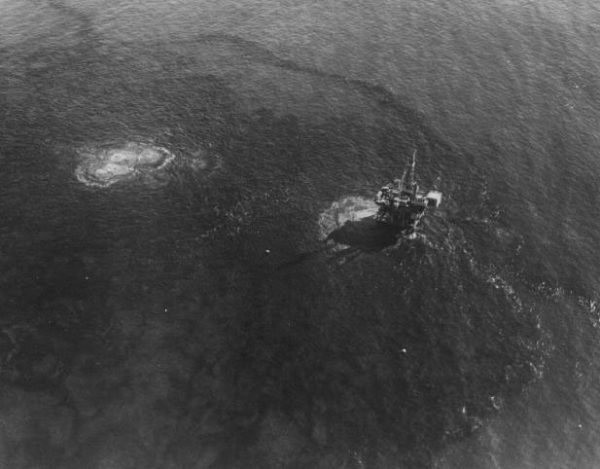 Under a lot of pressure, the oil had forced its way around the well and erupted through the ocean floor. A thousand gallons of crude poured into the ocean every hour. 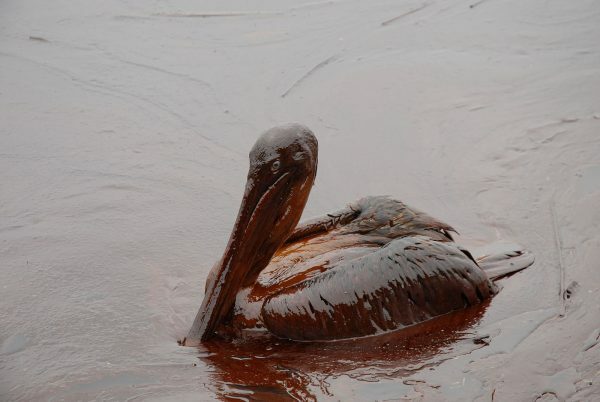 Crude oil floats on top of the water, making the spill particularly deadly for seabirds that dive into the water to catch fish. And so GOO! became the name of a new environmental organization that Bottoms helped launch in Santa Barbara. GOO!’s goal was simple: to stop all drilling and (eventually) get all oil platforms out of there. They held protests and marches. They organized a human blockade to prevent oil trucks from reaching the harbor. They even sent bottles of oil collected from the harbor to government officials to show them what people were dealing with. The oil spill quickly became an international news story, in part because of the timing. This was the very beginning of the modern environmental movement. Rachel Carson’s landmark book Silent Spring had come out just a few years before. 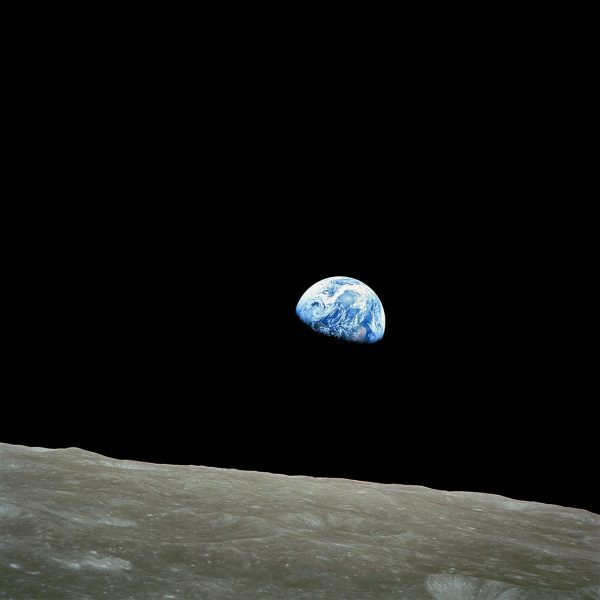 The Apollo 8 spacecraft was orbiting the moon for the first time, sending back photos of the earth looking like a blue-green marble in the empty desert of space. For the first time, people were beginning to understand that the planet was unique, small and fragile and that humans were doing a great deal of damage to it. All those gut-wrenching images of oil-drenched seabirds dying on beautiful California beaches resonated all over the world. Earthrise taken by Apollo 8 astronaut Willam Anders. The spill also fueled debates in Congress and helped rally support for some of the most important environmental bills in United States history. The 1969 National Environmental Policy Act was followed by the Clean Air Act in 1970, then the Clean Water Act in 1972 and the Endangered Species Act in 1973, among others. While the spill catalyzed a national movement, there was still the regional question of the platforms already in place off Santa Barbara. Local opposition put a stop to most new oil exploration off the coast of California, but the existing rigs have continued to operate for decades. Today many of those old platforms are reaching the end of their productive lifetimes. Based on their original lease agreements, these should be decommissioned and removed from the water. Groups like GOO! want the oil companies to return the Santa Barbara channel to the way it was before the platforms went in the water — a pristine ocean environment without any artificial structures. That simple goal, that members of GOO! have been fighting for since the 1960s, though, isn’t as straightforward as it might seem. 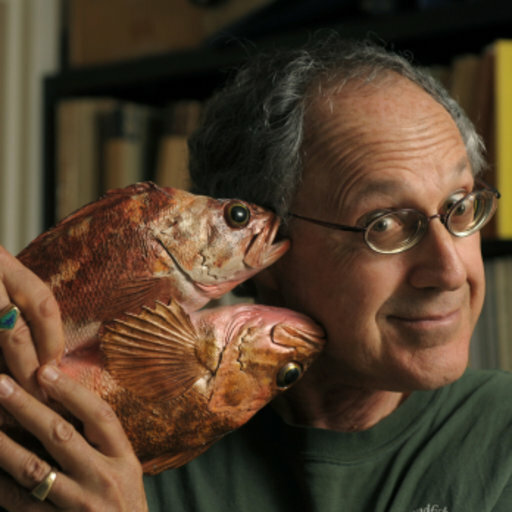 Research biologist Milton Love works at the Marine Science Institute University of California, Santa Barbara. He grew up fishing on the beaches and piers of Santa Monica and studied biology at UCSB, eventually ending up back at his alma mater where he started up his own research lab — the Love Lab. Back in his twenties, Love used to collect fish for a local aquarium. One day he and his partner took their little Boston Whaler out to the oil platforms and started fishing around them. They caught a lot of fish, which made Love wonder about the role the platforms might be playing as habitat for marine life. In the 90s Love received funding from the federal government to try and answer that question. So he got a team together, rented a small submarine, and began to study the platforms. He took a submersible all the way to the bottom, where the pylons reached the seabed. And he was blown away by the amount of fish he found. 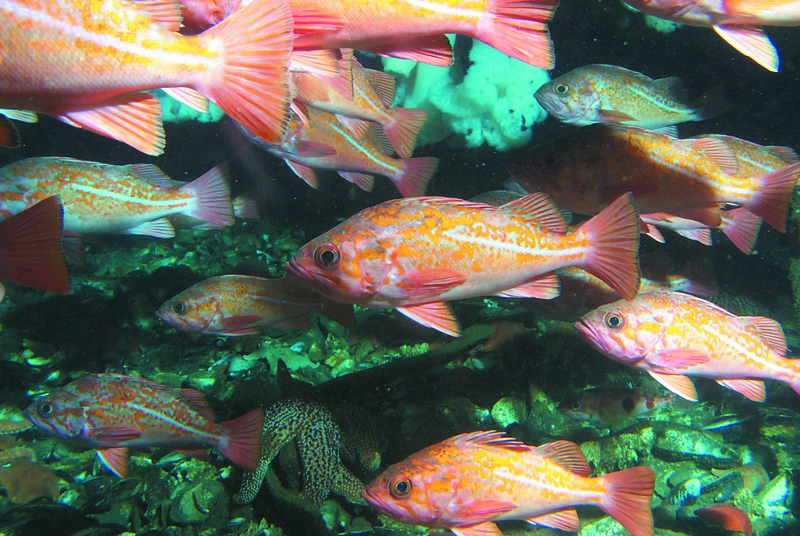 There were schools of adult rockfish swirling around the base of the platform. As he started making his way up the structure he saw a lot of juvenile fish as well. 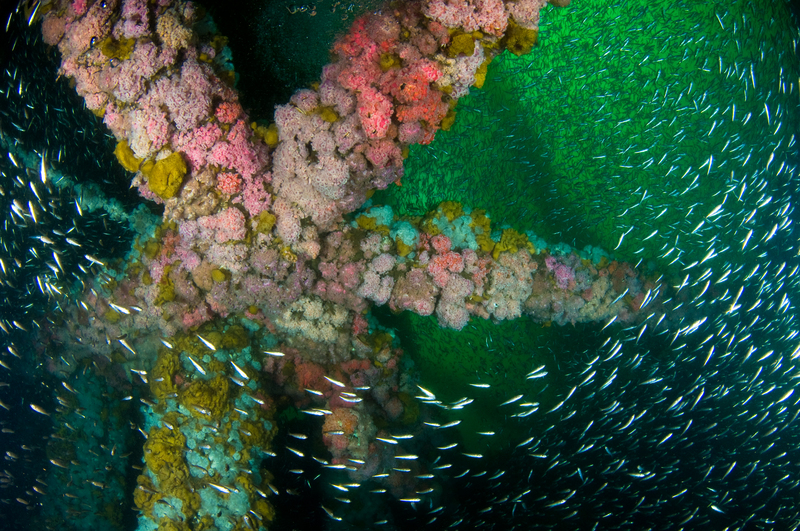 Plus, the metal of the rigs themselves was covered with all kinds of invertebrates — sea stars, muscles, sponges — and little crabs walking all over the struts. Oil platforms are particularly popular structures with fish in part because of these surfaces and niches, but also because they extend hundreds of feet through the water column like a marine skyscraper. So they provide homes for fish living at different depths — younger fish tend to live higher up the platform, for instance. To get to the bottom of how important these platforms were to ocean life, Love studied a species of rockfish called the Boccaccio. This species is heavily fished around Santa Barbara and around this time the stock was so depleted that the government closed the fishery. When Love did a survey of seven different oil platforms, he found there were about 450,000 young Boccaccio, which constitutes about 20 percent of the baby Boccaccio on the entire Pacific Coast. These platforms were, he included, important for rebuilding that particular species. And some would go even further. A few years ago, Jeremy Claisse, assistant professor of biological sciences at Cal Poly Pomona, tried to calculate just how biologically productive the platforms were. He concluded that they were among the most productive habitats in the world’s oceans — they had become fully functioning reefs. This research called in to question the wisdom of simply destroying these structures, and helped lead California to pass AB203, a bill known as “Rigs to Reefs,” in 2010. This legislation would allow the oil companies to leave an oil platform in place if it could be shown to have been a net benefit on the marine environment. The oil companies would still need to plug the wells and lop off the top 85 feet of the platform (so that boats could travel over it safely) but the companies would be allowed to leave some of the structure in place. The Environmental Law Center at UCLA gave the bill a grade of C-, saying that it “puts oil platform operators in the driver’s seat” and “constrains the discretion of our State agencies to protect the environment.” Yet so far, no oil companies have taken advantage of the bill, and the future of California’s offshore oil platforms remains up in the air. Of course, oil companies would love to save money by leaving platforms in place, but a lot of environmentalists aren’t sold on the idea of turning rigs into reefs. Some believe that leaving these rigs in the ocean breaks a promise — it tells a community that the people responsible for the mess in the first place don’t need to clean up their garbage. And a lot of environmental groups don’t want to sign off on a policy that would save the oil industry money, because they are currently fighting against NEW offshore oil development. Milton Love, for one, doesn’t think we should be doing any new offshore drilling — he would much rather see us push on to entirely renewable energy sources. And his research doesn’t mean that the oil industry is benevolent or that oil infrastructure is good for wildlife in general. 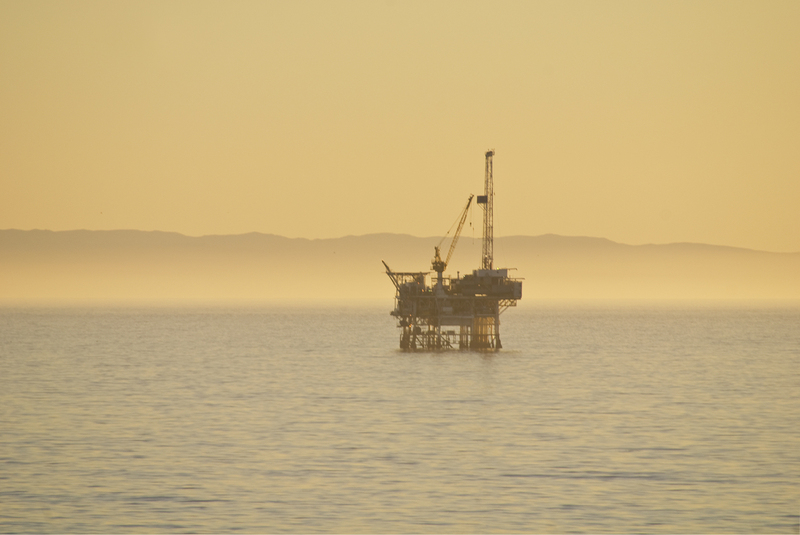 It just means that in a few instances off the Southern California coast there are oil platforms that have become a useful habitat for a few species of fish. After all, rockfish are just looking for a little structure. They don’t care if it’s a rocky outcrop, or a shipwreck or an oil platform. 99% Invisible’s Impact Design coverage is supported by Autodesk. The Autodesk Foundation supports the design and creation of innovative solutions to the world’s most pressing social and environmental challenges, including renewable energy generation as well as cutting-edge ways to support oceanic reef habitats. Learn more about these efforts on Autodesk’s Redshift, which tells stories about the future of making things across architecture, engineering, construction, infrastructure and manufacturing. The episode originally misnamed Carla Frisk, but has since been corrected and updated. there seems to be a word missing in the 2nd to last paragraph on this article. No pictures of the tattoos? Hi I am a renewable energy engineer and for the most part work in onshore wind farms but have been involved in various offshore wind farms in Europe. Actually I was involved with the Block Island wind farm. 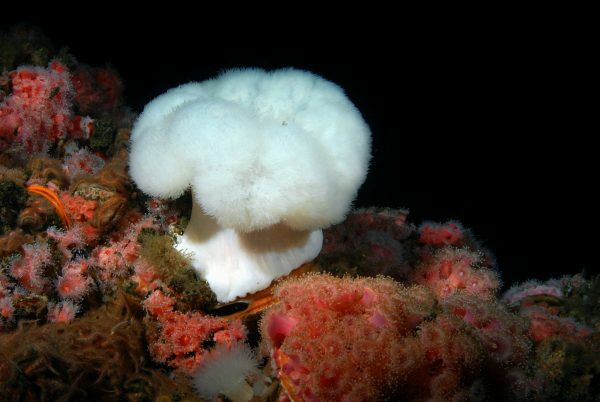 In my years of experience, I never heard any discussion about considering reef habitat within our designs. It is however interesting consideration for the foundation manufactures and don’t see why adding roughness to the steel pilón would be a financial burden. Love the show, keep up the good work. I was on the beach at Faria/Mondos/Mary’s Point during the spill. A buddy of mine surfed some great waves…and the oil was random but so thick it took him a week to get clean. Today the beaches are packed, the effect of even a minor spill would be unreal, as you can’t clean it up. 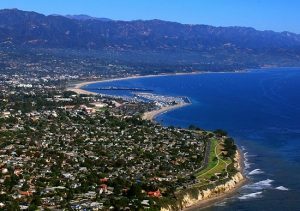 If anyone appreciates their environment, it’s the people in and around Santa Barbara and they know there are energy alternatives. “It just means that in a few instances off the Southern California coast there are oil platforms that have become a useful habitat for a few species of fish.” This is the only substantial conclusion about the impact of the platforms that can be made from the show – pretty modest. Why didn’t you ask Mr. (Dr.??) Love whether in these many years of studying this artificially induced habitat if he has studied the effect on larger food webs of (possibly) favoring a few species (possibly) to the detriment of other species, or more generally what has been the effect more broadly on the coastal community (community as defined in ecology) or even the biome? Has he done any peer-reviewed studies? Has 99% Invisible merely posed an interesting question and presented some implicitly biased answers by cherry-picking evidence? Please, if you are going to do science reporting be a bit more rigorous. Anyway, been enjoying the show for years. Great point about further research, as any scientist should be following scientific method through to the next iteration. One frustrating part about this episode is that the solutions and the problems seem to be all or nothing. Could the tops of the platforms be removed leaving the underwater stilts that hold the platform up? That way the habitats underwater remain while clearing the view and getting rid of the worst parts of the platforms. What am I missing? It seems to me that this also how the Jong Fahey song and album got their name, “The Great Santa Barbara Oil Slick”. I get sick of the environmental industry crying about these issues! Also these folks in Santa Barbara don’t mind using tremendous amounts of fuel for automobiles and industry and plastics. They just don’t want to see or deal with the ugliness of drilling despite their use of what comes from it!!! If you want not in my backyard then stop using the resources! Otherwise get over it!!! Don’t be a contradiction! !